Choose the newley opened Holiday Inn Riyadh-Olaya hotel for a central location, 30 minutes' drive from King Khaled Airport. Conveniently located close to the highway and Riyadh's leading businesses and malls, Holiday Inn Riyadh-Olaya offers a tranquil base right in the heart of Riyadh . Your Guest room is a spacious home-from-home with vibrant decor, plush throws and a flat-screen TV. Relax with a session in our sauna and cool off in the sparkling outdoor pool . Our extensive conference facilities include 14 high-tech meeting rooms and an elegant ballroom suitable for celebrations of up to 375 guests. Riyadh's diplomatic quarter and major companies like Deloitte and Touche and Motorola are just 10 minutes' drive from the hotel. Valet parking at Holiday Inn Riyadh-Olaya is available on request from our friendly Concierge . Browse for designer goods in the sky-scraping Kingdom Centre , 2km from the hotel, or opt for a more authentic Arabian shopping experience at Souq al-Thumairi , 6km away. Golfers can practise their swing at the palm-fringed Greens and Desert courses, both 30 minutes' drive from the hotel. Return to Holiday Inn Riyadh-Olaya to enjoy an invigorating workout with a personal trainer or simply unwind in our steam room and sauna . 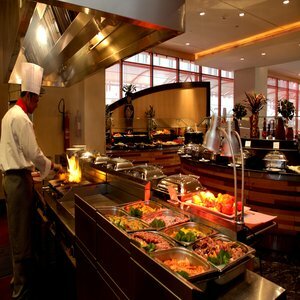 Our welcoming Al Dana restaurant features live cooking stations serving up a selection of sizzling Oriental and global cuisine.